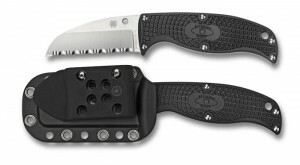 Description: The Enuff series of knives are small, functional utility knives designed for real-world application. They come with an injection molded polymer sheath, held by a G-Clip that is positional for vertical, horizontal or diagonal carry. Great little user. This entry was posted on Thursday, June 13th, 2013 at 2:52 pm	and is filed under 2" to 3" Knives, Designer - Sal Glesser, Handles - FRN, Manufactured - Japan, Steel - VG-10, Type - Fixed Blade, Type - Little Big Knife, Type - Utility Knives. You can follow any responses to this entry through the RSS 2.0 feed. You can leave a response, or trackback from your own site.